See more objects with the color peru saddlebrown darkslategrey dimgrey tan or see all the colors for this object. This object is not part of the Cooper Hewitt's permanent collection. It was able to spend time at the museum on loan from Olana State Historic Site	as part of Passion for the Exotic: Lockwood de Forest, Frederic Church. It is dated 1881. Its medium is turned, carved, painted, gilt and lacquered wood. 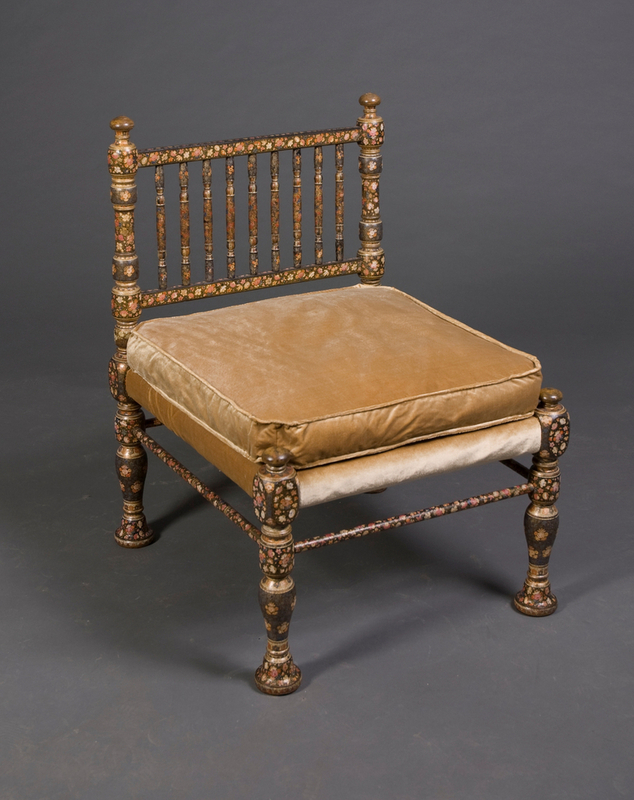 De Forest probably acquired this chair, an example of Kashmiri style (along with others now at Olana and elsewhere), on a stop in Kashmir on the way to visit John Lockwood Kipling, father of Rudyard, who had an art school in Lahore, then in northern India. It is credited Lent by Olana State Historic Site. This object was previously on display as a part of the exhibition	Passion for the Exotic: Lockwood de Forest, Frederic Church.